Foundations and Best Practices in Early Childhood Education helps teachers connect early childhood education beliefs and philosophies to professional practice. 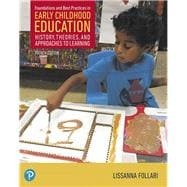 It provides insights into common program models or approaches, including Reggio Emilia, Montessori, High/Scope, Head Start, Waldorf, and The Project Approach. Real classroom stories illustrate how teachers and programs integrate child-centered approaches into actual practice. Running themes emphasize teachers’ roles, views of children, inclusion, and diversity. New and experienced teachers alike will learn to define, shape, and reshape their own practices to advocate on behalf of children and families. The 4th Edition reflects the most recent changes in early childhood education, including legislative and policy changes and the latest research on effective practice. Throughout the text, content has been expanded to include even more emphasis on inclusive practices and diversity. The Enhanced Pearson eText provides a rich, interactive learning environment designed to improve student mastery of content with embedded videos, interactive exercises, and quizzes.